How the lowly Artillery Genre became the highest selling video game, Angry Birds. It all started the year 1976 on the humble Tektronix 405x. 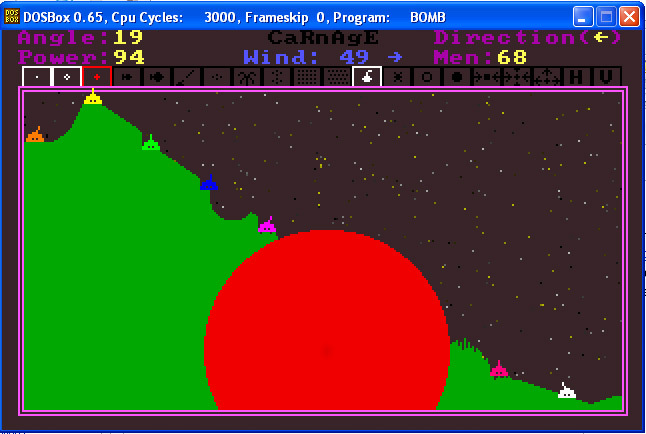 The game was coincidentally called Artillery, by Mike Forman. Like most "games" of the time period, it was a very solitary experience with no graphical element, nor was it available to the consumer. The game lived a humble existence as a text based demo for the BASIC programming language. 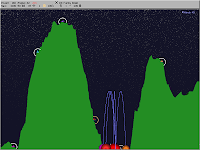 However, it gets credit as being the first computerized game to toss up projectiles at various angles and force with goals to hit a target at set distances, hence defining the genre. The game was later tweaked by M. E. Lyon and Brian West during 1977 (War 3) - 1979 (Artillery 3) for the limited home computer market. 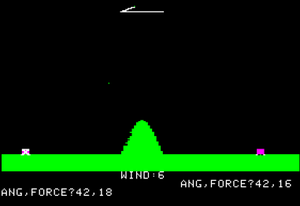 Artillery finally got a graphical version in 1980 for the Apple II. Now with a clear graphical element, wind variation, tracers, and various levels of terrain, the Artillery Genre was born ...and children, Battlefield did not create destructible environments; The Artillery genre had that covered very early on. The console market was known to pick up ideas from the nerdy computer gamers and those trendy arcades. Artillery games were no exception, and Smithereens! was released for the Magnavox Odyssey in 1982. In true console fashion, it added a 2 player component, making the game somewhat social. The heavyweights of the era Atari & ColecoVision were not to be out done, and released its own clone in 1983 called Artillery Dual (no relation to the original Artillery). Artillery Dual kept the same elements as its predecessors and added limited ammunition. But more importantly, the artillery genre had become visible to the mainstream consumer. With the Death of the Video Game Era upon the world, so too did the artillery genre become a casualty with no significant additions to the game type. It wasn't until 1990 that Kenneth Morse created Tank Wars for DOS. Many knew Tank Wars as BOMB, due to its exe name. Taking advantage of the mighty 286 & 386 processors, Tank Wars included many of the PC standards that we see in modern gaming, including: massive multiplay - 10 players!, multiple AI difficulties, randomization of the map (sorry Diablo), customizable game types/setups/mods, in-game currency, purchasing weapon/upgrades between rounds (including the ever popular Nuke), hit-points/attrition, and mouse UI. This game not only brought back the artillery genre, but brought it back strong with numerous revolutionary concepts that forever changed how we game. 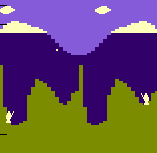 Much like the original Artillery, Microsoft made Gorillas as a tech demo for their QBasic language, hence was not marketed as an actual game. Although it didn't bring any new gameplay features to the table, what it did was exchange the mighty military elements like tanks and bullets, with family friendlier elements. The tanks were replaced with gorillas, while the choice of ballistics were explosive bananas. This marked the first time animals were used in the Artillery genre. Scorched Earth, often coined 'The Mother of all Games", took the Tank Wars concept and ran with it. Developed by Wendell Hicken, he relied heavily on the new shareware distribution model to increase its popularity. Scorched Earth expanded damn near every aspect of the game, adding: a plethora of offensive (bouncy bombs, napalm, digging munitions, etc) defensive (shields, mag deflectors), and survival elements (parachutes, batteries, etc). Though still keeping its roots of math and trajectory, the game focused on how well you could predict what your opponent would throw at you and defend against it. With the inclusion of all the new elements, the game was commonly referred as a strategy game, more then an artillery game, a practice still used today. It wasn't until 1995, when an actual game developer studio came by and decided to toss real money into the development of the artillery genre and market it for the masses. Although Worms started as another indie (Andy Davidson via Blitz BASIC), it was picked up by Team17 Software to turn everything they've seen in the genre and make it accessible to all. Often sited as "a cross between Cannon Fodder and Lemmings" for its cartoony look and feel, it encapsulate all the fundamentals that had been in Scorched Earth. Once again, we see the inclusion of animals instead of the tired tank, allowing it to be accessed by a whole new audience (which we refer to as casual gamers today). Worm-mania became so popular the series managed to slither itself onto 30 stationary and mobile platforms. With financial backing from various publishers, including Microsoft and Sony, 17 titles had been released in the Worms franchise. Among them, they introduced over 60 weapons (including the notorious Banana Bomb), 3D gameplay, team/squad play, internet multiplayer, movable units, and campaign mode. Unfortunately, like many long lived franchises, over the course of 12 years the series has become tired with little more then novelty changes in each release. With titles like "Worms: World Party" it was safe to say, "They jumped the Shark. -IGN"
Similar to your artillery ballistics, the genre had its ups and downs. It was once again up to a small group of developers (Joey Betz and Chris Condon) to bring us back to the basic fundamentals of Artillery. They created Crush the Castle, a game that featured a limited amount of shots to knock down a castle with your trusty trebuchet. The concept was elegant, simple, and addictive. A new level would be unlocked after each successful round, featuring a new castle with stronger walls, different targets, trickier approach, and slightly different munitions. No longer were you trying to kill or be killed, instead it focused on skill and approach. And if you failed; just try the round again. Aside from simplifying the genre, the game introduced a new gameplay element seen in other genres: physics. Like many of the games on this list, Crush the Castle was free to play via web based flash and poorly marketed. In late 2009, developer Rovio noted the simplicity of Crush the Castle, and went the Team17 approach: market the hell out of it. 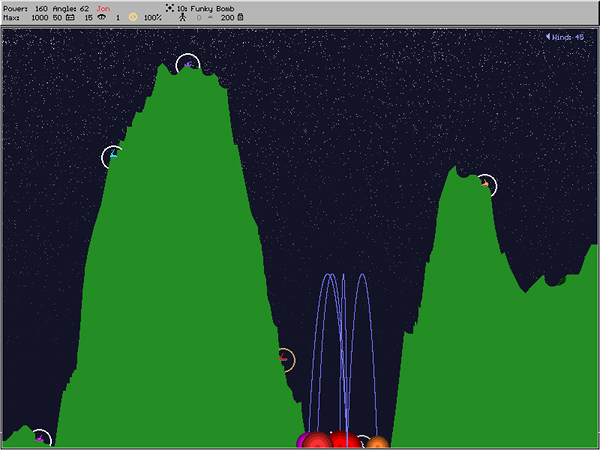 The game was named Angry Birds, after the birdie ballistics in their game. Very similar to Crush the Castle in solo gameplay and concept, Angry Birds goes one step further by adding the accessibility of animals, various types of goofy munitions, touch based controls, and most importantly accessible to the casual iOS mobile market. The game was incredibly easy to pick up and put down on a whim. The result is the most sold title in the Apple App Store, and the most distributed video game, ever (over 700 million). Its hard to predict what the next big artillery game will be, or if there ever will be another again. As we learned with Worms, too much of a good thing, can lead to an end of innovation.